To journey or wander on vacation evokes such feelings of freedom. For years, we’ve roamed the country visiting friends in new cities, taking in the sights and sounds of a new culture during a European adventure, or relaxing on a sandy, white, Caribbean beach while soaking up the sun’s rays. Now, with a baby in tow, these exciting, stimulating and rejuvenating jaunts of yore may seem like a lifetime away. 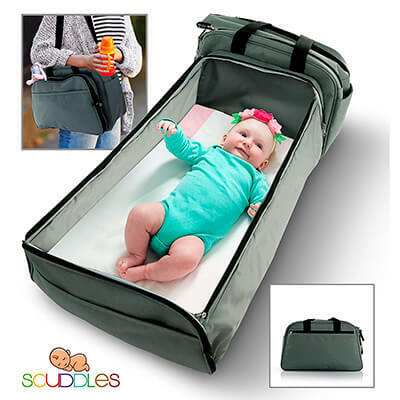 You used to be able to throw a few items into an overnight bag and be gone for the weekend, but now you must consider all the things that the baby will need so both you and the little one can enjoy the trip. Not to worry, there are many parents who have come before you and can offer advice on what to pack and how to navigate traveling with a baby. Believe it or not, some parents don’t slow down their travel schedule at all after the baby is born. Also, many times mom or dad goes it alone when traveling with the baby. It’s all doable – it just takes some planning to ensure that you are (mentally) prepared for the journey ahead. Also, you don’t have to get your baby completely off schedule or disrupt his/her routine; there are ways to have it all! First and foremost, you must remain calm. If you get worked up and stressed about the journey, your baby will sense your negative emotions and get cranky. It’s a lot to coordinate, especially the first time, but don’t let anxiety rain on your parade! Try to book a flight time that allows the baby to retain his/her usual schedule. Definitely, take the time zone of your destination into consideration when you are booking your flight. Also, avoid layovers like the plague; direct flights are the best option for only having to get settled in one time and eliminating variables like missing a connecting flight. Some things to consider are Tylenol, ibuprofen, cotton swabs, diaper cream, thermometer, bath soap, baby lotion, infant toothbrush, toothpaste, nail clippers, noise canceling headphones, dish soap in a travel container (to clean bottles, etc. ), grocery bag for dirty clothes, baby wrap or carrier, disinfecting wipes, rice cereal, hand sanitizer, sunscreen with SPF 100, sippy cup with straw, puffs, applesauce pouches, noise machine, blanket for airport floor, blanket to snuggle, toys, a few books, clothes and hats, plus a baby monitor. You’ll need to pack some diapers for the trip, but remember, you can purchase more when you get to your destination, so don’t overdo it. Pro Tip: don’t forget to pack an extra outfit for yourself. You’re likely to end up with spit up, poop, pee, vomit, milk, cereal or other fluids on you after a flight! If you’re a worry wart (like me! ), you’ll want to have all the baby’s necessities with you in a carry-on bag. In the event that your checked luggage gets lost, make sure you have diapers, diaper cream, socks, onesies, bottles, binkies, books, snacks and a sweater on hand for the plane ride and beyond. Pro Tip: refrain from packing snacks or bottles in the outside compartments of your diaper bag; they’re sure to tip over, spill, and make a mess when going through the security conveyor belt screener. This is a much easier feat if you’re traveling with a partner, but you can certainly do it on your own if you stay organized. Firstly, ask a TSA agent if there is a designated stroller line; being in the appropriate line will help you feel calmer when approaching security. Consider carrying your baby on you in a wrap or carrier. 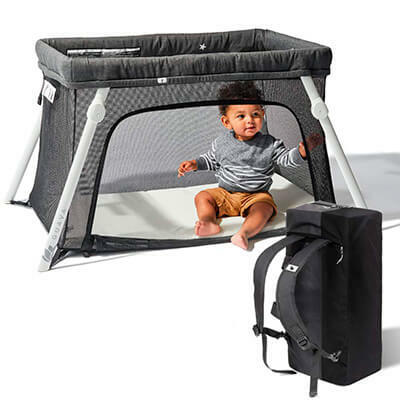 When approaching the screener, place your laptop in the basket of the stroller and then put your carry on above the basket. 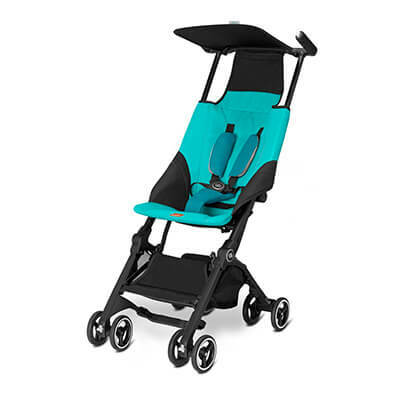 Now, attach the car seat on top of everything and put your diaper bag in the car seat and on the stroller handles. This will help everything stay organized and you can put things where they need to go – on the conveyor belt, directly handed to a TSA agent, etc. Pro Tip: Stay calm. We all know traveling with a baby is stressful, so just take your time in the TSA line. Ask someone for help, if needed, and try to stay calm, cool and collected even amidst death stares from other travelers. Ask the gate agent if the airline can accommodate giving you an extra seat (for free) so you can more easily take care of the baby in flight. If the plane isn’t full, the agent will typically move your seat to help. Also, try to avoid the back of the plane so you won’t have people standing in the aisle, near your seat, waiting for the bathroom during the flight. Most airlines let parents with children and infants board early, so take advantage of this policy, if you can. You’ll have an easier time settling in on the flight and won’t feel as rushed. Also, let your baby be a social butterfly when traveling! As you’re boarding the flight, face him/her out so other passengers can interact with the baby. Also, once on the flight, let him/her stand on your legs and look at the passengers behind you. It keeps the baby occupied and usually other passengers like the interaction as well. Pro Tip: announcements in the airport and on the flight are loud and frequent. Consider getting your baby a pair of noise-canceling headphones to prevent waking him or her up from a nap. Consider leaving the car seat at home and just bringing an umbrella stroller when traveling abroad. This will minimize all the “stuff” you have to carry; additionally, you can always rent a car seat from a car rental company. Regarding your accommodations, if you can rent a home or apartment to stay in while traveling overseas, this will help the baby (and you) stick to a schedule more easily. Having a separate bedroom for the baby, a kitchen sink to wash bottles and a place to do laundry will certainly come in handy! Also, consider packing a baby monitor, especially if you are staying in an apartment or home away from home. If you are staying in a hotel abroad, make sure they have an elevator and that its large enough to accommodate you and all your stuff – or at least you and a stroller! This will make it much easier during arrival to and departure from the hotel and for all the days in between as you are coming and going. Also, pick a hotel that’s close to attractions. This way, you can easily get back to the hotel to put the baby down for naps and it won’t be an added chore. Pro Tip: all babies have accidents, so when you’re traveling bring some plain, white onesies that you won’t care about parting with after a particularly messy incident. If your baby has a number two accident and soils his/her onesie, just discard it instead of having extra, poopy laundry to deal with as you’re on the go. When a baby is small, they don’t need much. Take a few toys and books with you, but don’t overdo it. You should also download to your phone the baby’s favorite music and a video or two that keeps him/her calm – this will come in handy when trying to keep the baby occupied or if he/she is fussy. If you’re breastfeeding while traveling, make sure you pump a significant amount of times prior to your departure. Also, consider bringing a small cooler with an extra bottle or two of frozen milk just in case you don’t feel like breastfeeding on the flight. When traveling, you can’t be shy; you will have to breastfeed in cabs, in lines, in museums… everywhere and anywhere. You’ll have to just decide what your comfort level is when it comes to breastfeeding in public and adjust accordingly. Of course, traveling can always be full of surprises, but preparing yourself as much as possible beforehand will cut down on anxiety and stress leading up to and during your trip. And remember, most of the time when you are traveling, it’s for fun and adventure. Make sure to enjoy yourself throughout the trip. It’s never too early to expose your baby to the wonders of the world. Kudos to you for being a brave traveler with a baby in tow!